What happens when two friends suddenly become three? Cece Bell's very funny follow-up to the Geisel Honor-winning Rabbit and Robot: The Sleepover. Rabbit is excited. He is going to surprise his good friend Robot at home. DING DONG When Robot opens the door, he is surprised. He wasn't expecting Rabbit. In fact, he is already engrossed in a game of checkers with another friend, Ribbit. Now Rabbit is the one who is surprised, and a bit jealous. 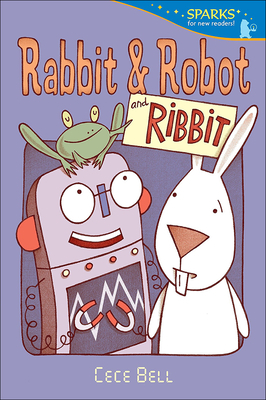 While Robot thinks everything Ribbit says is humorous, all Rabbit hears is "ribbit." And Ribbit eats flies with her popcorn. Gross When Rabbit and Ribbit get mad because they both want to be Cowboy Jack Rabbit, Robot's Emotion Decoder overheats, leaving him out of commission. Can Rabbit and Ribbit find a way to work together to revive their friend? New readers will find plenty to chuckle over as Robot's two friends become friends themselves.